Casey James hits his mark dead-center with his new 14-track Blues release, Casey James - Strip It Down, produced by Grammy® Winner Tom Hambridge. Joined by Ron McNelley, Tommy McDonald, Delbert McClinton, Pat Buchanan, Muscle Shoals Horns, Tom Hambridge, and Wendy Moten, former American Idol finalist Casey James proves his talent as a singer, songwriter, and guitarist. Casey James - Strip It Down was produced by Tom Hambridge. Casey James wrote, or co-wrote, all the songs on the release except for the Mertis JR John and William Edward John song, Need Your Love So Bad. The 14-track release opens with the guitar forward, All I Need, written by Casey James, Tom Hambridge, and Terry McBride, with its lyrics, "I don't worry ‘bout this, don't worry ‘bout that, you can't go back..."that is a treat for the senses with Casey James singing and playing lead and rhythm guitars, Ron McNelley on rhythm guitar, Tommy McDonald on bass, Kevin McKendree on Wurlitzer, and Tom Hambridge on drums and contributing background vocals. Delbert McClinton joins Casey James in a duet on Bulletproof written by Casey James, Delbert McClinton, and Al Anderson, with some pounding piano by Kevin McKendree then continues with the song, Hard Times, Heartaches & Scars, which gets its punch from Muscle Shoals Horns while spicing up the track with great horn interludes; the song segues into the track, Hurt Me More. The catchy I Got To Go will keep you moving and grooving even if you never leave your chair with Kevin McKendree playing hot piano and a B3 organ on this one. Tom Hambridge sets the pace with a powerful drum intro on Messin' Around, written by Casey James and Adam Searan, with Kevin McKendree on piano, Wendy Moten adding background vocals, Tommy McDonald on bass, Pat Buchanan on bass, and Casey James playing lead and rhythm guitars. Casey James and Adam Searan team up again on the co-written titletrack, Strip It All Down, which is out-and-out fabulous; great lyrics and well-crafted instrumentals make it a definite winner. Casey James takes it nice and slow on the 1956 song, Need Your Love So Bad, written by Mertis JR John, and William Edward John. The release keeps on the slow and easy with Different Kind Of Love, written by Casey James, Steve Pasch, and Jonathan Edwards, and is another favorite of mine, with its great horn opening contributed by Muscle Shoals Horns, with Kevin McKendree playing B3 organ, and lovely background vocals by Wendy Moten. Picking up the pace, Casey slides into Supernatural with PatBuchanan on rhythm guitar, Kevin McKendree on Wurlitzer, Tommy McDonald on bass, Tom Hambridge on drums, percussion, and tambourine, Wendy Moten adding background vocals, and Muscle Shoals horns. Next in the play list is Killin' Myself, a great track co-written by Casey James and Tom Hambridge. Get ready for Jump Blues with some rollicking piano by Kevin McKendree on the song, Makin' Up, written by Casey James and Brice Long, which will have you on your feet dancing to this fast-paced tempo and singing along with its catchy lyrics. Delbert McClinton adds background vocals and handclaps on this one. Stupid Crazy features Bonnie Bishop providing background vocals to Casey's lead vocals, with Kevin McKendree layering in the Wurlitzer. The release deftly closes with Fight You For The Blues, with Rob McNelley opening with a wicked slide guitar. 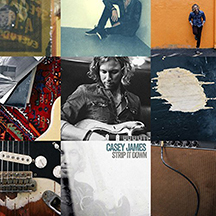 From start to finish, Casey James - Strip It Down, is downright fabulous, so pick up a copy and be sure to read the liner notes and the lyrics to fully appreciate Casey James - singer, songwriter, and guitarist.